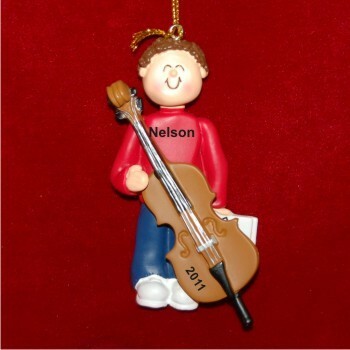 The handsome cello virtuoso male brown hair personalized Christmas ornament celebrates the talent of your favorite cellist. It's offered in blonde, African American and female versions too. These musical instruments ornaments personalized by hand in a stylish font are available in lots of other instruments too. A golden cord is attached to our male brunette cello player personalized Christmas ornament that makes a great gift following a successful recital or concert. Gift Dec 29, 2016 Marilyn S.